If you haven’t heard of Making Cards, they are the UK’s best value card making magazine. Each issue is packed full of step-by-step card projects demonstrating a vast array of techniques and beautiful designs that are unique to Making Cards readers. Plus, there are free craft papers with every issue that are fantastic to use on a range of projects. What’s a typical day like as editor for Making Cards magazine? Every day is varied as there is so much to do! It all starts with me checking my emails (with a cup of tea of course!). I may have to respond to contributors ensuring they know the projects they are doing and deadlines, there will be press releases about new products that I might consider using in projects or for our new product pages and much, much more. I then check our social media sites; I personally reply to any queries and ensure that nothing goes unanswered. I then open the post, I like to do this myself too and get first glimpse of all the amazing projects that come in before passing them on to my colleague Joanne, our Project Editor. Once done I then move on to the rest of the day; I may spend the day in the photo studio overseeing the photography of all the projects, setting up the stages and directing the photographer, I may be on the computer writing an article for the magazine such as our shopping guides or competition pages, arranging the creation of our fantastic free craft papers or I may be compiling a flat plan for the next edition or proofing articles back from the team of designers… among many other things! What do you enjoy most about your role at Making Cards? The varied role is probably the thing I enjoy the most. I’m lucky in that if I’m not particularly in the mood for something one day I can do something else and then return to it the next day. As long as I’m within deadlines of course, with 13 editions a year we have a very tight schedule! Photography has to be booked in, as does the design of projects as many of my colleagues will be working on several titles at once. I love thinking up new project ideas and then seeing them come to life from our amazing team of contributors! I am so lucky to enjoy my role so much. How do you keep coming up with new and exciting craft tutorials? There are many ways we come up with ideas. Ideas can come from the contributors; after all they are all leading experts in the field of card making and are absolutely on the ball when it comes to the latest trends and launches. I am so privileged to work with such a talented team. Inspiration comes from new launches and I also peruse the internet for inspiration, I have to set myself a time limit on Pinterest or I could be on there all day! I also listen to our readers – what they would like to see, after all they are the most important factor. I also find inspiration in everyday life and try to see if I can apply this to card making. I like to include something different – for example we have a project coming soon using nail varnish to create brilliant backgrounds! What advice would you give to someone who fancies a career as an editor? Creativity and an eye for detail are probably two of the most important skills you should possess as an Editor in the craft magazine market, as well as an excellent command of English. If you have these skills and the ability to apply them to a magazine in a way that will interest the readers then this could be the job for you! Work experience will help you prove yourself and an on line presence – being very careful what you share of course! Other skills such as financial awareness, commerciality and legal knowledge can all be learnt on the job. Do you like to craft in your spare time? I love to craft when time allows. I’ll give anything a go! Just yesterday I attended a papercutting course which was fun. The next thing I would like to try is freehand embroidery – I’ve seen some absolutely beautiful work at craft shows. Also pottery, as I’ve just inherited a couple of kilns from my Grandmother, it would be great to learn how to use them properly! I love looking through patterns too, I’m a bit of an addict, not patterns of the instruction kind but beautiful illustrated seamless patterns! What’s your favourite crafting trend at the moment? I’m in love with the current trend for mixing pastels and neons, likewise the popular combinations of geometric shapes with the beauty of hand scripted fonts, a bit ‘Scandi’. Team a bit of watercolour in there and I’m sold! There are a lot of household objects that have adopted this style such as printed quotes for the wall that you can easily design yourself, arty pots that you can make with concrete which seems to be quite trendy at the moment and of course anything monogramed or personalised – this I love, it is so easy to give someone a really personal gift you have made yourself. Have you ever had any crafting fails? I always ask this in interviews I conduct and not once has the answer been no! I think the funniest one was just recently – I was iris folding a penguin design and was using the text part of newspaper for the white front of the body and the darker photos for the black areas (quite quirky I thought!). The process went perfectly…until the time came to turn the design over! Unbelievably two pairs of letters appeared next to each other to appear to spell out a very rude word right in the middle of the penguins’ chest! I didn’t want to make it again as it was so good so the photography kindly photo shopped one of the letters! Thank goodness for technology! What’s your favourite Trimcraft collection, why? I love the new Premium Paper Pads from the First Edition Pick ‘n’ Mix collection! I really like the mix of geometric shapes teamed with the hand drawn patterns – very ‘on trend’ right now as they say! The added foil feature makes it even more special. The trouble is when I love a paper pad I don’t want to cut it up. So many times I wish I could have the pattern as wallpaper around my home too! You have kindly given us a year’s subscription to give away, tell us a bit about the magazine. I’m so proud of Making Cards magazine. It is packed full of quality projects by very talented contributors, each project is unique and never seen before. The step-by-step instructions accompanying each card are incredibly easy to follow making even the most technical of cards achievable for all. Presented together with the projects are shopping guides showcasing the latest launches, competitions, interviews, celebrity appearances and more. If this wasn’t enough each magazine comes with 16 free quality single sided craft papers, you will find inspiration for projects using these papers in the magazine. If you sign up to receive our monthly e-newsletter you receive bonus craft papers in digital format to accompany the set as well! What a brilliant interview! Sally sounds like she loves her diverse and creative role at Making Cards. 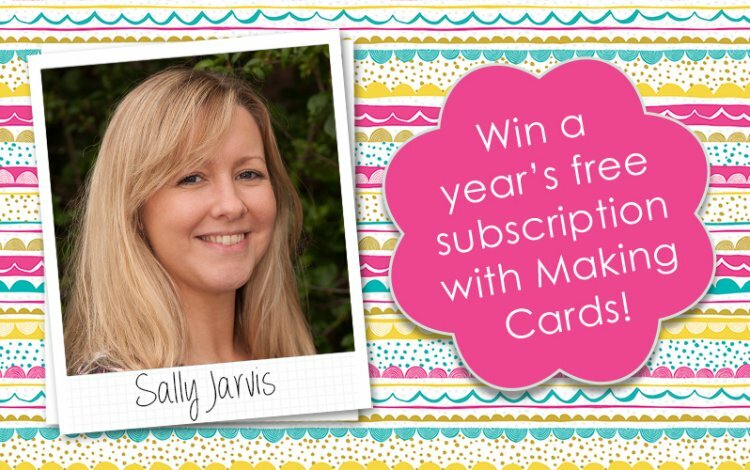 We were also lucky enough to have a giveaway with this article; one crafter will win a year subscription of Making Cards magazine, imagine all of the card making inspiration you will get! For your chance to win, simply log in and join this competition before the 31st March 2016. Good luck everyone!